Explore beautiful Fraser Island on a tag along tour where you will have the chance to drive! Drive along the sand highway! Fraser Dingo Tag Along Tour allows you to explore the stunning Fraser Island for 3 days and 2 nights! Visit Lake Wabby or Eli Creek, The Maheno Shipwreck and the Pinnacles; stop by Indian head for great photos and go for a dip in the Champagne Pools - this tour allows you to visit all the highlights of Fraser Island! 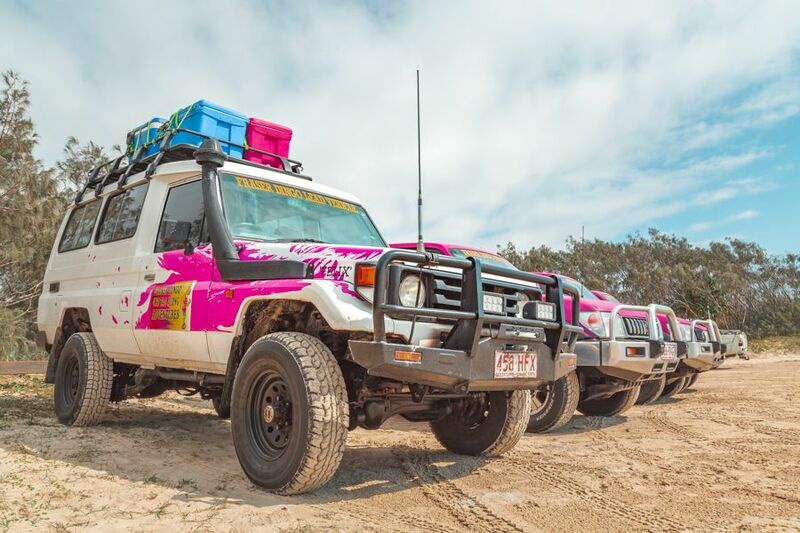 You will get to drive around the island in a Toyota Land Cruiser 4WD enjoying the thrill of driving on the sand highway of Fraser Island for a once-in-a-lifetime experience. Tag along as you make your way around Fraser Island for the opportunity to experience one of the coolest driving experiences in the world! By choosing a tag along tour, you have the option of driving on the sand highway and inland tracks of Fraser Island! You will follow your lead car, driven by your tour guide, during the duration of your tour as you make your way from place to place. You can nominate yourself as a driver if you fit the requirements of Fraser Dingo, and take the opportunity to drive to some of Fraser's most iconic locations. But don't worry - driving isn't a requirement. You can also sit back as a passenger and just enjoy the ride. Lake Birrabeen - A calm and quiet blue lake that's great for swimming! Champagne Pools - Nature's jacuzzi, complete with bubbling water! Meet for a safety briefing at 7:30am for the tours drivers, 8:30am for those not wanting to drive, followed by a quick shopping trip to pick up groceries for the trip! The barge departs for the island at 10:15am and arrives 30 minutes later at Wanggolba Creek. You will start your island trip by making your way up 75 Mile Beach to Happy Valley for a BBQ lunch at about 12:30pm, where you will get to know your follow travellers and designate rooms at your accommodation. Afterwards, head to Eli Creek, Maheno Shipwreck and the Pinnacles or even Lake Garrawongerra if it's high tide! Around 4:30pm you will head back to your accommodation, where you will get to relax, drink and enjoy some beach time before dinner at 7:00pm. Start the day early with an optional sunrise walk and then join in for a continental breakfast at 7:00am. Your day will be spent visiting Indian Head, Champagne Pools and a stop at Lake Allom on the way. You will get to enjoy lunch at Cathedrals on Fraser before again heading back to your accommodation for 4:30pm. Day 3 will start with a hot breakfast followed by visits to Lake Wabby, Central Station, Pile Valley and Lake Birrabeen. After all of these great stops, you will head to Eurong for lunch before heading to Kingfisher Resort, where you can walk or swim at the resort, making the most of your afternoon! You will leave on the 5:00pm barge, arriving back at Fraser Dingo Head Office around 6:15pm. *Please note that Champagne Pools will be inaccessible from February 3rd to March 29th 2019 due to renovations to the boardwalk. "Once the car is loaded you drive up to the ferry to go to Fraser Island. After you have arrived you drive to this little local village where you have the last chance to buy some necessary things. You have lunch here and leave soon after that to go for a swim in Lake Mackenzie. STUNNING! Second day you start off with a visit to the champagne pools. In the afternoon you go to Eli Creek. Enjoy a full day of swimming and beautiful spots. Last day you go and see the Indian head. Definitively recommend to drive yourself its soooooooo much fun!"